"NEW YORK" - Martyn Thompson. Ask a New Yorker “HOW ARE YOU?” and a likely response is “TIRED”… Well, that’s what I’m always saying. It’s competitive and sort of passive aggressive. It means ”I’m working harder than I really think I should be” and includes the assumption that you’re doing the job of 3 people… which is entirely necessary in the current economic climate. It totally supersedes “BUSY”… which used to be the standard reply — a sign of productivity and success, but that’s no longer enough, so there’s been a shift to this exhausted type notion that pervades the workplace here. Lots of businesses even encourage a culture whereby their employees virtually never leave the office…”work hard, work hard”. It’s all ultimately making sense of that phrase that enticed me here in the first place “THE CITY THAT NEVER SLEEPS”… but I’m wondering… was “TIREDNESS” what I had in mind as I made my way to Liza’s New York, New York? Trash on Staten Island, New York - Unknown photographer. This lack of rest seems also a result of the fact that when you actually stop working and want to go to sleep it’s getting harder to achieve a restful state — the New York I live in is getting noisier and noisier. Construction thats going on all day seems to be continuing on all night — jack hammers start up on Prince street at around 10 in the evening — which you’d think was illegal — and just when you have thought it safe open the window for some air, the garbage collection begins. This seems to have become a midnight to dawn exercise in Soho where the amount of trash generated daily is simply astonishing. This atmosphere does nothing to inhibit my own workaholism… it doesn't take much to get me into overdrive …something I am consciously trying to overcome. Getting a place outside of the city has certainly helped with this. When I climb aboard that bus in Port Authority to go to Woodstock each weekend I can feel my muscles relax… and I start thinking in a different way than I do in the city. I’ve lived in Manhattan nearly 20 years but it’s only the last 2 I’ve joined the town and country brigade… making that weekend exodus to restore me to sanity. None of this is helped by the so called “smart” phone. I’m obsessed with my phone and the that fact that I just cant get away from it. It’s not that i don't want to talk to anyone — I do — but I don't want to also check my email, Instagram and news of the world, in pavlovian dog manner, each time I message or call someone — the proximity is addictive. So this last weekend I introduced a personal “phone free day”. Fortunately I’m so old I can remember a time when we didn't even have answering machines and made plans well in advance and stuck to them… a sort of nostalgic heaven it seems, and I'm often to be found floating happily in it. 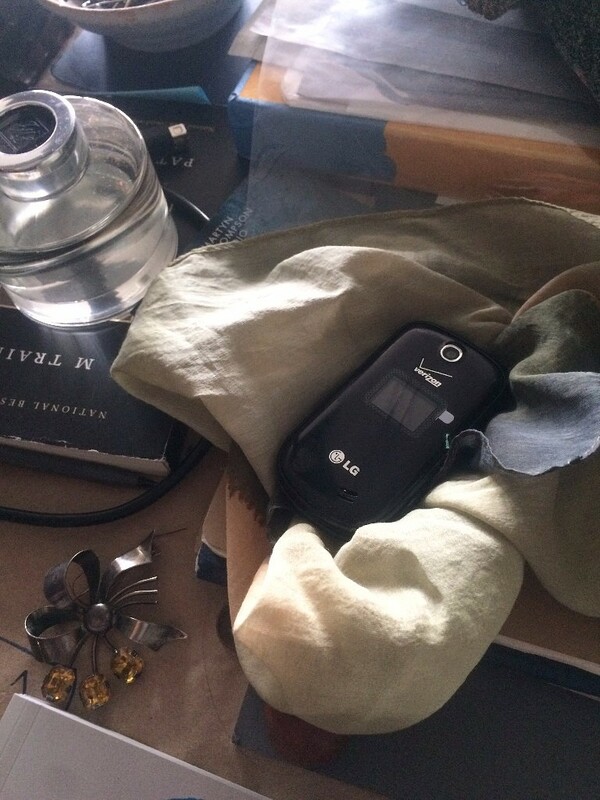 My experiment went so well that I hastily purchased a flip phone and transferred my number… (in self congratulatory manner)… and I’m brutally reminded that texting wasn't quite so easy in the old days… (hopefully I get used to it!). and I must agree — that is the way forward. The Red Moon - Martyn Thompson.